Have you ever heard of a ballplayer from the 1920s and '30s named Max Bishop? More than likely, you have heard of the '27 Yankees, with their menacing nickname: Murderers' Row. Max Bishop was not a member of Murderers' Row. On the contrary, Max (or "Maxie") Bishop was the Second Baseman for Connie Mack's great Philadelphia A's teams that took the American League crown from Murderers' Row by winning the AL pennant in 1929, '30, and '31. 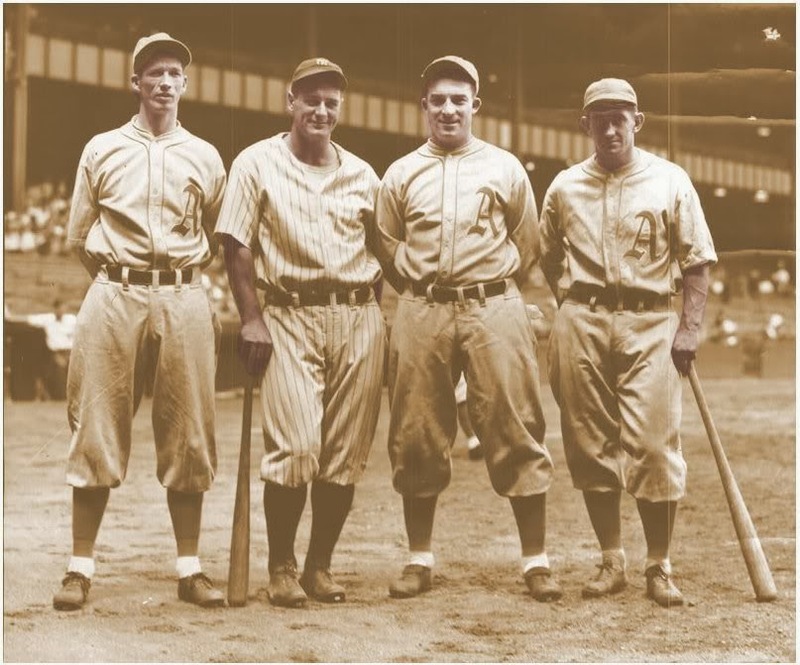 More famous from those A's teams were all-time greats Lefty Grove, Jimmie Foxx, Al Simmons, and Mickey Cochrane. Lefty Grove has a claim as the best pitcher of all time. He debuted late, at 25 years old. He led the league in ERA nine times, first when he was 26 and latest when he was 39. Grove also led the league in strikeouts the first seven years of his career, and K/BB ration eight times. Jimmie Foxx won three MVP awards, was often called the right-handed Babe Ruth, and his top comps on Baseball-Reference are Ted Williams, Lou Gehrig, Manny Ramirez, Frank Thomas, Mel Ott, and Mickey Mantle. Al Simmons began his career with eleven consecutive seasons of a .300 or higher batting average. 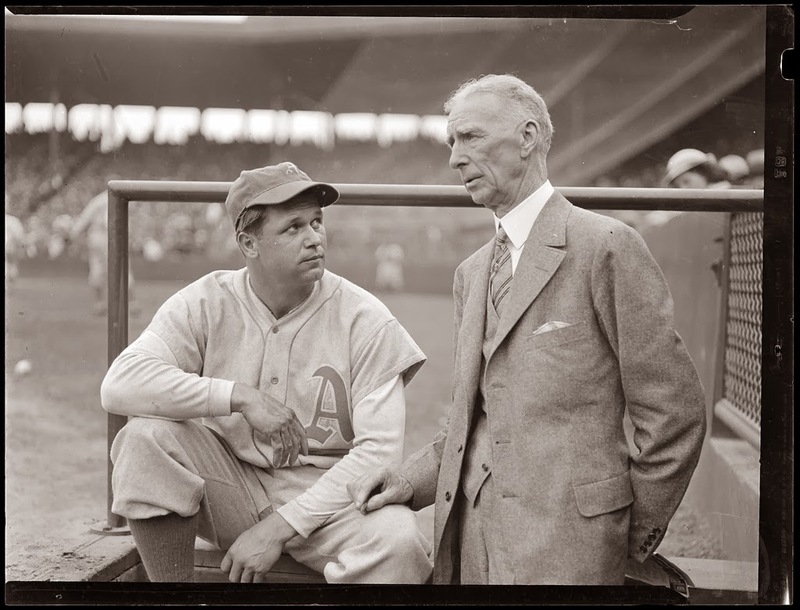 Over a seven consecutive seasons, from 1925 through 1931, Al Simmons batted .372/.415/.622. Shibe Park was a pretty good hitters' park, but Simmons still average a 159 OPS+ those seven years. Michey Cochrane is one of the two or three best hitting catchers of all time. His career .419 OBP is the highest of all qualified catchers, as is his .413 wOBA. Cochrane wasn't as much of a slugger as Mike Piazza, but his .320/.419/.478 slash line compares favorably to Piazza's .308/.377/.545 (.390 wOBA). Max Bishop has a rare stat line in his own right. His .423 Career On-Base Percentage is the 14th best OBP of all time, tied with "Shoeless" Joe Jackson and Dan Brouthers*. Bishop walked over 80 times in ten consecutive seasons, over 100 walks in eight straight. Five times, he had more walks than hits. That's rare. *You've certainly heard of Joe Jackson, but a here's little background on Brouthers: Dan Brouthers is a Hall of Famer who was born before the first Lincoln-Douglas debate, before Minnesota became the 32nd state, before the Civil War. His Major League debut was in June 1879, four months before Thomas Edison demonstrated electric light. Okay, enough about would be 155-year old Dan Brouthers. No player in the history of baseball mastered the art of working a walk as well as Max Bishop. His nickname, Camera Eye, was well earned; he must have had one of the best set of batting eyes of all time. The career slugging percentages for the four players listed above are .634, .607, .366, and .690, respectively. The largest difference between career Batting Average and OBP, among all 5,219 players who've had at least 500 plate appearances, belongs to Max Bishop (.423 OBP - .271 AVG = .152). Conversely, the smallest differential belongs to Warren White (.256 OBP - .255 AVG = .001). Warren White has the lowest BB% of all time, at 0.1%. He walked just twice in 725 recorded career plate appearances, but that was in the 1870s, when it took nine balls for a walk. Since 1920, the lowest career BB% of any batter with at least 500 plate appearances belongs to another middle infielder from the A's. 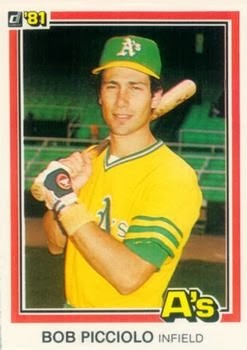 Rob Picciolo played mostly for the Oakland A's during an eight year career from 1977 to '85. Picciolo walked just 25 times in over 1,700 plate appearances.